Nous sommes désolés, mais l'espace Large workshop location comprised of 3 rooms in the city centre n'est plus disponible. 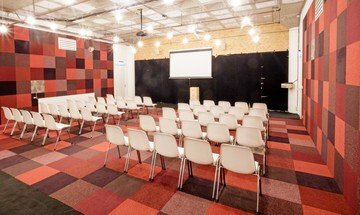 Rent this meeting room in Amsterdam. This area of 80m2 is very flexible and can be turned into a space that is suitable for any kind of business event. Are you looking for a room with a professional, business setup for a large or small meeting? No problem this space is the perfect candidate for your event. 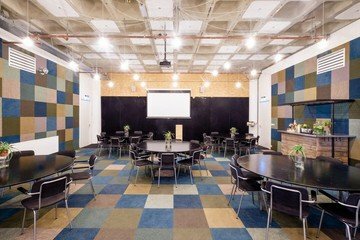 Do you prefer a space in which you can have an interactive, informal workshop? This workshop room also is very appropriate. Because of the size of this great space, it is suitable for up to 150 people. The decorations in the room, such as several paintings and plants, create a very pleasant atmosphere. The room also contains a projector, speakers, Wi-Fi, TVs and DJ equipment. If you want to get some fresh air during or after your intensive workshop or meeting, you can do so by going to the roof terrace of this amazing venue.